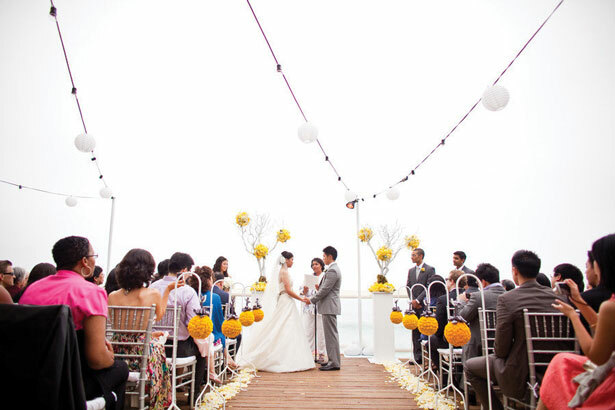 Many couples marry each year, but few are fortunate enough to tie the knot in Laguna Beach. For the lucky ones who decide to say their “I dos” locally, there are several spectacular places in town and in nearby Dana Point. Whether you opt for an outdoor ceremony in the fresh air and overlooking the Pacific Ocean, or to throw an inside grand affair, these special spots will ensure your wedding will truly be an affair to remember. A rooftop deck with panoramic ocean and mountain views and the symphonic sound of lapping waves ensures true Laguna ambience for weddings held at the historic La Casa del Camino. Built in 1929 and once a playground for old Hollywood, the Spanish-style hotel features remodeled rooms and public areas with furniture imported from Spain. About a dozen modern “surf suites” decorated by local surf brands and designers counterbalance the Old World charm. The large and airy ocean-view suites are favorites of bridal parties preparing for the wedding and of couples on their wedding nights, says Melissa DeAngelo, special events manager. Additional options for wedding ceremonies and receptions include a wine room and adjoining outdoor courtyard—complete with burbling fountain—or the hotel’s K’ya Bistro and grand lobby. Couples can also rent out the entire hotel if desired. At Montage, incredible views and immaculate grounds combine with exceptional service for a day not to be forgotten. “There are two factors most couples love about us,” says Jamie Puffer, director of catering. “First and foremost, we only hold one wedding per day, so couples really appreciate that exclusivity. And we are on the water just 50 feet from the sand, on a cliff overlooking the ocean.” Able to accommodate up to 375 reception guests in its larger ballroom, the resort has two ocean-view lawns for wedding ceremonies. “One has more of a horizon view and the other has crashing waves,” Jamie says. “Couples will often have the ceremony on one lawn and cocktails on the other.” Options for smaller and less formal weddings are also available. Feel the sand between your toes and see the ocean lapping under your feet at Pacific Edge Hotel. 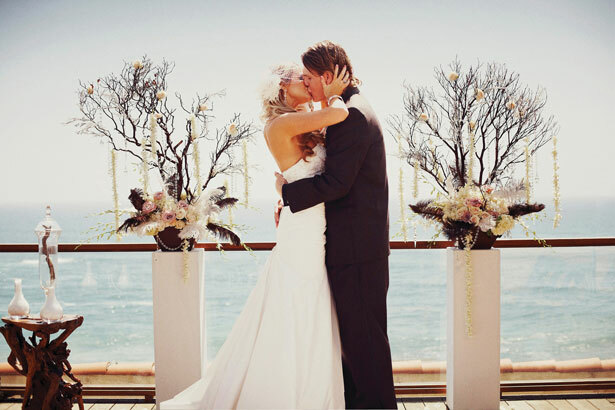 Its beachfront location and casually elegant vibe make the property a perfect choice for a wedding, according to Bree Vetere, marketing coordinator. “We have the only restaurant in Laguna that is actually on the sand,” she says. The Deck, an open-air restaurant, is available for ceremonies and receptions, just steps from the water. The three-story beachfront villa allows for smaller indoor weddings with ocean views through French doors opening to the outside. Fully furnished surf cabanas with a private deck are also available in combination with the restaurant or for smaller events. A variety of wedding day arrangements can be organized for up to 150 guests. “People who come to us for weddings usually want something creative and different,” says Dora Wexell, executive director. “We are pretty unique as a venue; our building is [ultra] contemporary, and it is an art environment, so that sets the tone for everything.” The property houses subsidized artist residences and the 4,500-square-foot main space is open as a gallery when no events are taking place. There is always art on exhibit, and sometimes couples want to bring their own art for their day, Dora says. The beachfront Surf and Sand Resort opened more than 60 years ago, and although it has been changed and remodeled since, it still remains “a staple in Laguna,” says Michelle Olewinski, catering and conference services manager. Tivoli Terrace and Tivoli too! European-style venues are not out of reach, even in California. Nestled in Laguna Canyon, Tivoli Terrace and Tivoli Too! are romantic choices for couples seeking enchanting outdoor garden settings. Owner June Neptune designed and hand-planted the gardens in the 1970s. 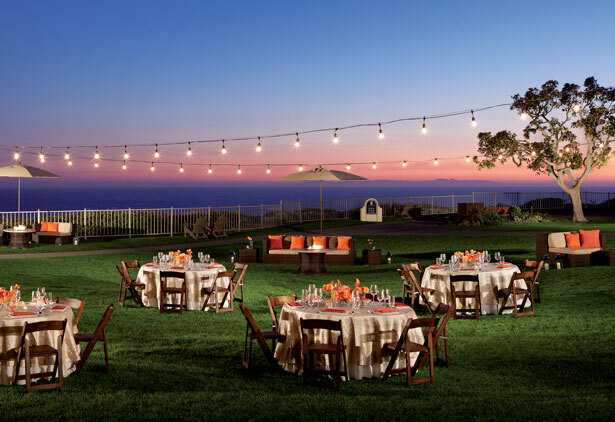 The St. Regis Monarch Beach has something for everyone looking to plan a wedding, says Kelly Odell, senior catering manager. “It is the best address for any couple’s most memorable day because of our five-star, five-diamond service, exquisite food and impeccable grounds,” she asserts.